I just got back from take your daughter to the museum day. Well, it is not an "official” day, and my daughter is not exactly a grade schooler, being 21 and in college. She decided to get her motorcycle license last summer, and after she took the course and got her endorsement, we got her out on her first "vintage” bike, a 1981 SR250 Yamaha she bought herself from a local gentleman. I figured that she would like to see the Vintage Display that is open from now until June 23, 2013, at the Washington State Museum in Tacoma (just South of Seattle). That, and I figured I could use an extra person along for the car pool lane. "Let’s Ride” showcases Northwest historical themes, like commercial motorcycles and their uses, clubs and their activities, racing, celebrity motorcyclists, and of course vintage bikes! Most of the 30 or so bikes were gathered from local collectors, while the themes and pictures were put together by The Pacific Northwest Museum of Motorcycling. Other displays were complements of celebrity riders like Tammy Sessions, who was one of the first women to compete in professional motorcycle racing in the early '70s. Most of the bikes come from local collectors, and riders, along with memorabilia backgrounds and pictures from the era the motorcycles represent. You will see a Yale 4p that was used as a messenger and package delivery service bike in Seattle by the company that became United Parcel Service (UPS): Pope, Pierce Arrow, early Harley Davidson singles and twins, and a 1906 Indian Camel Back Single in original paint unrestored condition. The ’06 Indian is one of only two known to exist with original paint! You can also see the History Museum’s own unrestored Indian horizontally-opposed inline twin 250cc 15.25 cubic inch, from 1918! This is a very rare bike that was donated to the museum, and was kind of the impetus for the Washington State Historical Society to put on this show. There are a lot of very cool bikes here and great stories to go with them! The informative display is located in what is considered to be one of the best history museums in the Northwest. Much of the other exhibits represent regional historic industry and conservational nature themes from Washington, Western Canada, and Alaska. The bike stuff fits right in! The museum is in the Historic Downtown area of Tacoma, near the Glass Museum, and America’s Car museums. You can find more information at www.washingtonhistory.org, and at www.pnwmom.org The show runs through June 23, 2013. 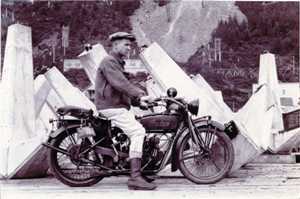 Photos courtesy of the Pacific Northwest Museum of Motorcycling archives.